Did he? Let’s look at the evidence. In 1920, Warren Harding won the popular vote by a little over 26% — which is to say his nearest rival, James Cox, got 26% fewer votes. Calvin Coolidge came close to that in 1924 with a little over 25% of the popular vote. Even Richard Nixon won 23% of the popular vote in 1972. So surely Trump, the master persuader — sorry, Master Persuader — easily trumped them? In actual fact, in the league table of 49 presidential elections ordered by the percentage of popular vote, Trump is 3rd from bottom with a negative majority of -2.10%. Of the 60.2% of Americans who voted in 2016, only 46% voted for Trump — which means only around a quarter of illegible voters were persuaded by the Master Persuader. By way of comparison, Barack Obama had positive majorities in his two elections: +3.86% in 2012, and +7.27% in 2008, and even at his lowest ebb, George W Bush (2000) had a negative rating of just 0.51%. Of course, the popular vote doesn’t determine the outcome of a US presidential election. That’s done through their Electoral College, and there Trump did win the nomination, getting 56.5% of the delegates’ votes. But even that wasn’t a “bigly” win, placing him 39th out of 49 presidential elections and nowhere near the +90%s of the likes of Roosevelt, Reagan, Lincoln and Nixon. Apparently not. According to the latest Gallup polls, Donald Trump’s presidential job approval rating is at 37%. By way of comparison with other elected presidents in the second January of their term, the next lowest was Ronald Reagan (in Jan 1982) at 48%, and Barack Obama (in Jan 2010) at 49%, while the highest was George W Bush (Jan 2002) with an approval rating of 84%. So by purely empirical tests, Donald Trump is not a master persuader! Still, Adams argues that failing such tests proves nothing. Except it seems that 63% of Americans have yet to feel the love. Adams’ previous book, How to Fail at Almost Everything and Still Win Big: Kind of the Story of My Life (2013), was an entertaining introduction to both Adams himself and his theories about persuasion, goal setting and why we do the things we do. Win Bigly is the opposite. A hodgepodge of self-congratulation and past blogs that appears to have been thrown together to satisfy a publishing contract. Would Adams make the same argument for Harvey Weinstein, et al? The picture Adams presents of Trump is wildly at odds with that presented by Michael Wolff in Fire and Fury: Inside the Trump Whitehouse. Adams image is of a master persuader restlessly pacing about in his Lair of Persuasion, working tirelessly on ingenious schemes to Make America Great Again. Wolff portrays Trump as an arrogant, egotistical, nepotistic, childish, and downright nasty character who never expected to win the election in the first place. (He just did it for the publicity.) So does that mean Trump really lost bigly? Wolff’s controversial book offers no such a distancing disclaimer. Prophetic words. A pity he didn’t listen to himself. 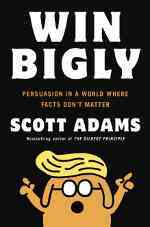 If you’re a fan of the Dilbert comic strip, you’ll like the “Trumpbert” cartoon on the cover, but that’s about as good as Win Bigly gets. If you’re looking for a engaging, informative and Trump-free book on persuasion, I suggest Robert Cialdini’s Influence: The Psychology of Persuasion instead.